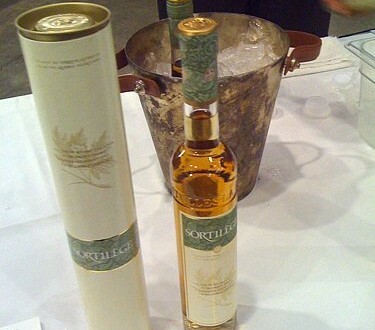 The BC Hospitality Expo last month had the usual assortment of entertainment accoutrements, but we were there to judge one half of the Sortilège Cup. Hosted by Nons Drinks, this was a battle between the sexes to see who could make the best cocktail containing Sortilège, a maple whisky liqueur from Quebec. Monday was the men’s cup, won by Simon Kaulback of Boneta and Tuesday brought out the ladies cup, for which I was a judge. Contestants ranged from seasoned competition vets and brand new first timers, with a couple of mixologists even coming over from Vancouver Island for the event. Marlo Panucci from Market kicked off the comp with a superbly executed Maple Fumé, complete with maple-stuffed cinnamon, smoked glasses and an agar ravioli ball. Cocktails had to contain at least .5 oz of Sortilège and ran the gamut from bacon-infused to apple-y with all kinds of thoughtful garnishes and glassware. It was hard not to be blown away by the creativity and innovation brought to the table. 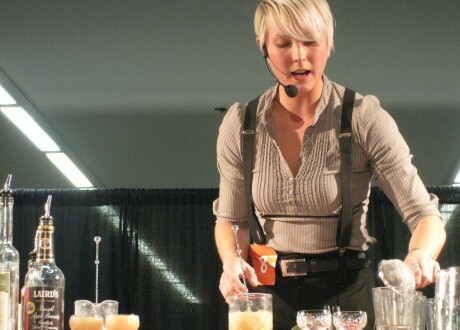 Danielle Tatarin (pictured, top) of the soon to be opened Keefer Bar took first place honors with her “Geisha’s Milk Punch”, an exotic cocktail that contained milk fruit juice, a South-east Asian fruit, cherimoya, Chinese tinctures and edible gold. 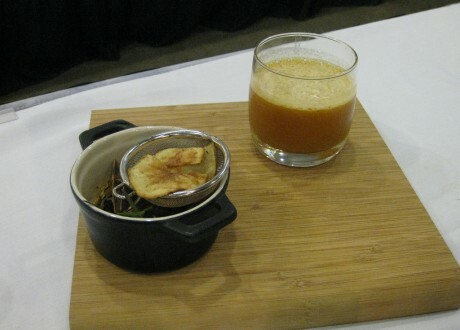 Lauren Mote of The Refinery placed second with her “Feu de Camp” (pictured, above), a savoury drink made from madeira, honey mead, house bitters, whiskey and puréed squash. The ‘feu’ part came on the side with a fragrant smouldering bundle of herbs and smoked chips. Third place went to Chambar‘s Wendy McGuiness and her cocktail, “Île d’Orléans”, a sweet and savoury mix containing grappa, thyme, whisky, grapefruit juice, pear juice, and garnished with Sortilège candy powder and maple-coated thyme. I was somewhat dubious at the segregation of a men vs. women bartending competition, but it’s as good a way as any to divide up a large field and after seeing the scoresheets – half of the women scored as many or more points than Simon Kaulback the day before – I can’t help but wonder if our local female bartenders are on the brink of something big.